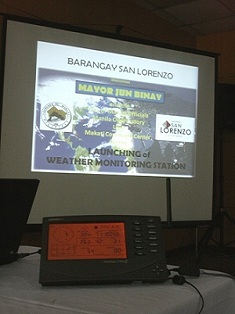 Makati City and the Manila Observatory take on climate change and disaster risk management together as the city’s weather monitoring station project was formally launched in Barangay San Lorenzo by Makati City Mayor Jejomar Erwin Binay, city officials and barangay kagawads. 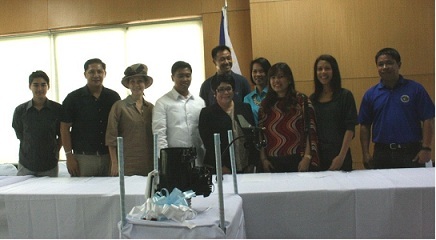 Manila Observatory’s Executive Director Antonia Loyzaga said that Manila Observatory (MO) will assist in Makati City’s Disaster Risk Reduction (DRR) work through the weather monitoring project by providing instrumentation support, and assisting in information exchange and climate analysis. Dr. James Simpas from MO’s Urban Air Quality and Instrumentation and Technology Development programs gave a brief introduction on the weather station and the parameters it measures and showed the interface for viewing the weather data. Makati City Mayor Binay said that the weather data will help them monitor populated areas that are prone to flooding, and also help them decide on the suspension of classes (this role has been passed to the LGU from the DepEd just recently). 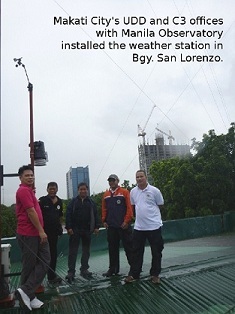 Three weather monitoring stations were already installed in the Makati City Hall, Barangay Poblacion, and Barangay San Lorenzo prior to the launch, and five more stations will be installed in the coming weeks.